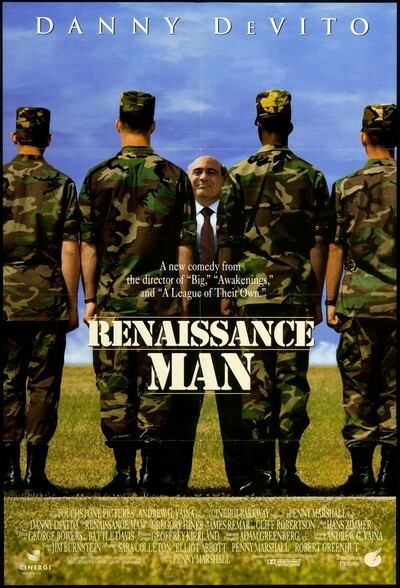 Brief Synopsis – An unemployed ad executive is given a job teaching a group of soldiers who need to be prove they are smarter in order to graduate. My Take on it – I saw this in the theater in ’94 when it came out and for some reason never felt an urge to rewatch it. Having done so, I now understand why. This movie starts off with an interesting premise and then just goes downhill from there. At the beginning one thinks that perhaps Danny Devito is there to give a Robin Williams-like inspirational performance that we saw in Dead Poet’s Society (1989), but in the end we are left with a teacher who is even worse at teaching than Schwarzenegger was in Kindergarten Cop (1993) (and he taught toddlers). This movie left me with no inspiring feeling and after slightly more than two hours, I couldn’t figure out how and why his character changed his attitude on life. With the idea of an ad exec becoming a teacher I had also hoped for some great comedy like Crazy People (1989) delivers with a similar premise, but in the end, the jokes all fall flat. I know I’m being very generous but I would say that this movie is slightly below average but isn’t terrible. Bottom Line – there’s a reason that it took me twenty years to watch this again and that reason is that this movie gives an interesting premise a very mediocre delivery.